The nerve root block is useful for identifying the responsible site of radiculopathy. It is also a very useful nerve block in terms of treatment. For safe and reliable operation, it is desirable to do it under fluoroscopy or under ultrasound guidance. 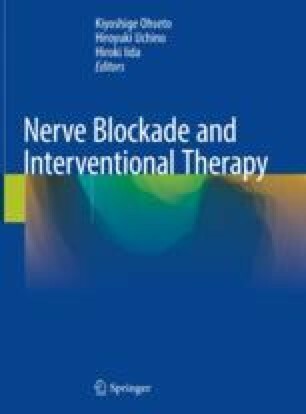 While nerve root blocks are useful for both diagnostic and therapeutic purposes, some of the techniques are associated with radiating pain, causing some patients to avoid receiving repeated block treatments after their unpleasant initial experiences. With the recent arrival of less invasive techniques, it is now possible to choose techniques that are less uncomfortable to patients. For example, cervical nerve root blocks may be administered without causing radiating pain by using an ultrasound imaging device to make sure the needle tip is held within the perineural area. Likewise, radiating pain associated with lumbar nerve root blocks may be minimized with the use of the safety triangle method or the intervertebral foramen approach . Although the diagnostic usefulness of nerve root blocks has been decreasing with more use of MRI, they are still useful for identifying the responsible nerve root out of multiple nerve root lesions.